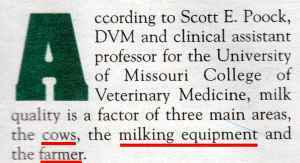 Cows, the milking equipment, and the farmer. You’ve been wasting your time on chasing other metrics, haven’t you? Actually, that’s too facile of a quip. Many people would have you know that this teaches you an important lesson: quality is what is the customer/consumer/audience thinks is good. Uncle Herb’s milk might be blue, but that’s good milk, right? The software might cause laptops to catch fire, but that’s only a problem if the user uses a laptop; ours don’t (that we know of), so it’s quality (unless the customer changes its mind). Friends, there are teleological quality assurists, and there are deontological quality assurists. You can guess where I fall. Certain elements of quality exist outside a project, outside a storyboard, outside a sprint, and yea, verily, outside the customer’s expectations. If you’re doing patchwork, get-the-paycheck-oriented quality, it’s going to catch up with you. Hey, I was just making fun of a headline there. What happened to this post? It got deep all of a sudden. This entry was posted on Monday, June 18th, 2012 at 2:25 pm by The Director	and is filed under Philosophy. You can follow any responses to this entry through the RSS 2.0 feed. Both comments and pings are currently closed.